Offering a nice feature set, a little bit of style, very good image quality, and a street price around $200, Canon’s PowerShot A1100 IS is a great starter camera for the point-and-shooter who demands a little more image quality than what the cheapest point-and-shoot cameras provide. The A1100 sports a plastic body that is well made, with no creaks or moving seams. The right side bulges a bit to create a hand grip, and the camera’s 4x zoom lens retracts to be fairly flush with the camera’s body. At 3.7 by 2.5 by 1.2 inches, the camera is a little bulky for some pockets, and its use of two AA batteries makes it a little heavier than cameras that use a proprietary rechargeable battery. But the A1100 is still small enough to easily slip into a coat pocket or bag. On the back of the camera, you’ll find a 2.5-inch LCD screen and a set of controls. The top of the camera houses the power button, mode dial, and shutter/zoom control. Canon has done a good job of standardizing the control layout and on-screen interfaces across their point-and-shoot line, which means that the time you spend learning the A1100 will serve you well if you ever use another Canon point-and-shoot. The A1100 offers the standard assortment of automatic features. From the mode dial, you can choose between Auto mode, Program mode, Movie mode, and a number of scene modes. In Auto mode, the camera will make every critical exposure and setting choice for you, while Program mode lets you manually set ISO, white balance, flash use, and other settings. The camera lacks priority or manual modes, but it does let you adjust exposure compensation, which is often all you need to adjust for certain types of scenes. Most people who are shopping for a $200 point-and-shoot aren’t interested in manual controls, and on the A1100, scene modes become the best option for getting good results in tricky situations. With the mode dial, you can select from five different scene modes, or choose SCN, which allows access to even more scene modes that are chosen from an on-screen menu. A scene mode simply sets the camera’s exposure settings based on specific situations. Portrait, for example, tries to choose exposure settings that will yield a softer background. Canon provides far fewer scene modes than other vendors, but the choices cover just about any situation you might encounter, and having fewer options makes it easier to remember what each one does. The A1100 IS has a 2.5-inch LCD. The camera has a nice feature set, offering three different light meters, but eschewing more complex features such as focusing modes. The camera’s autofocus is very good, and a button on the back of the camera lets you activate Face Detection, which automatically focuses on faces in your scene. Like face detection mechanisms, the A1100’s works well-when it works. In good light, it will almost always work fine, but in lower light situations, you might find it a little frustrating. The camera’s 4x zoom lens offers a very nice range, from fairly wide to surprisingly telephoto (for a camera this small). The lens is optically stabilized, meaning it includes special mechanics that can counteract hand shaking. Canon’s stabilizer is excellent, and does a lot to deliver sharper pictures, especially in low light. The A1100 also offers an exceptional macro mode, which lets you get as close as 1.2 inches from your subject. You can even use it with the camera’s very good video mode, which shoots 640 by 480 video with sound. The camera’s 2.5-inch LCD screen is OK; I found it to be a little washed out, which made seeing fine details a little difficult, especially in bright daylight. The A1100 provides an optical viewfinder, a very welcome feature when shooting in situations that make the LCD screen difficult to see, and it’s not bad. It only shows about 85 percent of your final scene, but that 85 percent crop is from the very middle of your scene, rather than off-center as it is on some Canon cameras. When reviewing an image, a half-press of the shutter button pops you immediately back into shooting mode. This is how a camera should work, and it means you never have to worry about missing a shot while reviewing images. Image quality should always be your primary concern when making a camera choice, and in this regard the A1100 delivers. Its 12-megapixel sensor packs enough pixels for very large prints (you can easily use the camera’s photos as 13-by-19-inch prints). Color is very good, and the camera’s lens delivers good sharpness and suffers from no discernible distortion, vignetting, or chromatic aberration. One of the most surprising things about the A1100 is its low noise. Shooting up to ISO 400 is surprisingly clean, and even higher speeds, such as 800 and 1600, are very usable, even in low light. Certainly there are cameras that perform better at these speeds, but they’re also much more expensive. You get a lot for $200 when buying a camera these days. 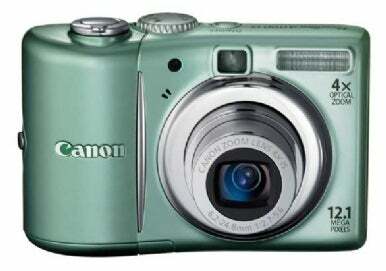 The PowerShot A1100 IS provides a very good price/performance ratio, and it’s even available in four fashionable colors (blue, green, grey, and pink). If you’re looking for a good entry-level camera, you should consider the A1100.